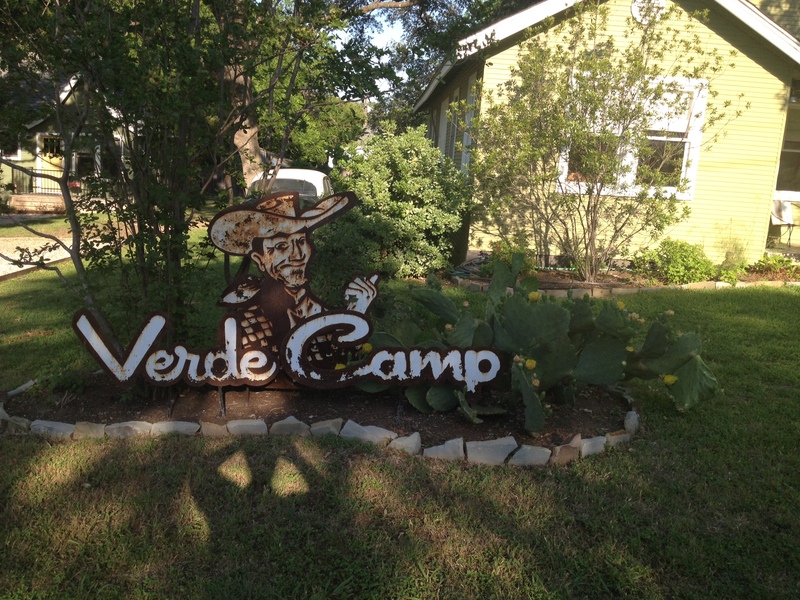 I’m getting ready to head back on the road again (this time for a business trip) so I thought I’d share a few photos of Verde Camp, the wonderful place where Simone and I stayed in Austin. It’s a grouping of little houses that were built in the 1930s and lovingly refurbished by a husband and wife team. 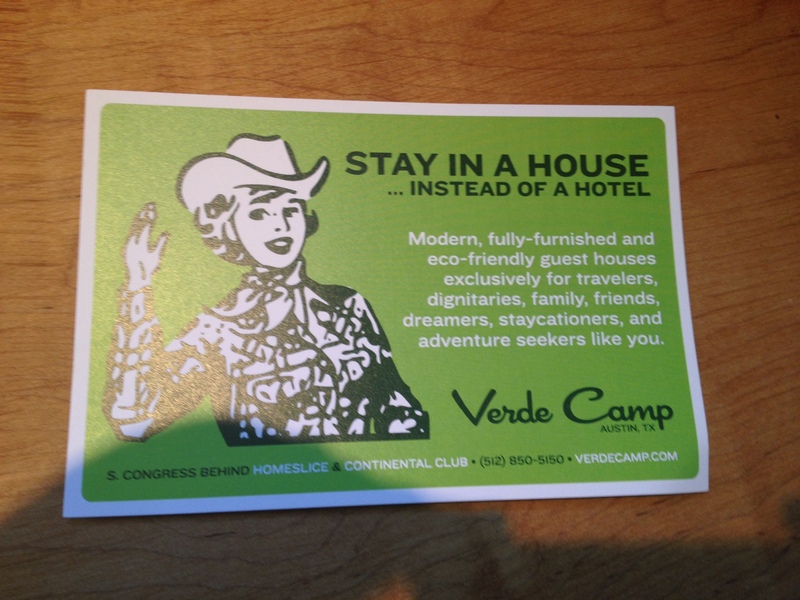 Bruce and I discovered Verde Camp in 2010 when we wanted to get away from the Big D for the weekend and see Austin. 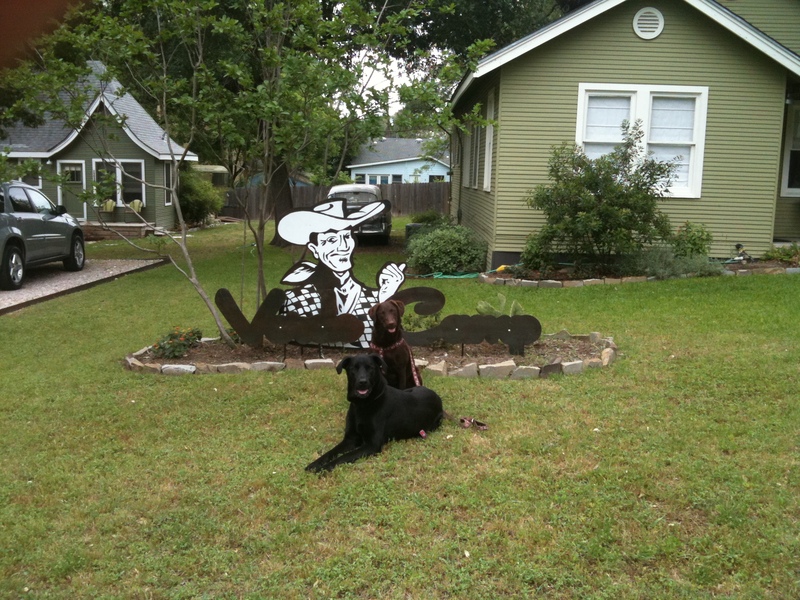 We also wanted to bring Guinness and Godiva along since we had heard Austin was super dog friendly (it is!) and thought it would be a fun trip for all of us. We liked that it was dog-friendly and eco-friendly, plus we’d have our own little cottage with a kitchen so we could have breakfast, cocktails, and snacks. 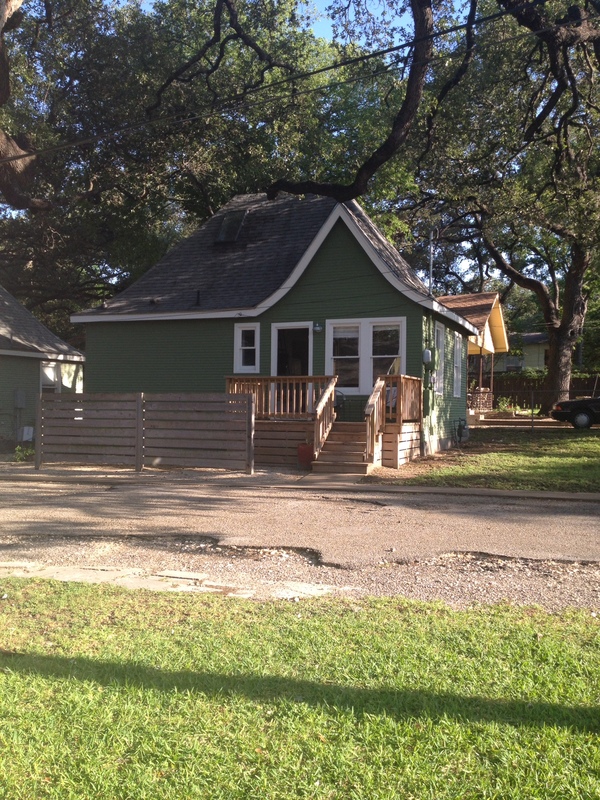 It’s in easy walking distance to lots of fun stuff: Town Lake, South Congress, the Continental Club, Homeslice Pizza, the University of Texas, the downtown area, Zilker Park, and the Capitol. It’s certainly better than a hotel in my opinion—it feels more like a vacation home or cottage up in Ontario. Since then we’ve been down a number of times with Guinness and Godiva, then Guinness, Godiva and George (Gidget has not made the trip yet). One time we even brought some human friends along and had a blast. I’ve always thought it would be really awesome to get a big group of friends together and rent a bunch of cottages so we could all hang out during the day but have our own spaces at night. Maybe one day—seems like it could be a fun way to celebrate a birthday…. This time Simone and I stayed in Cicada House. 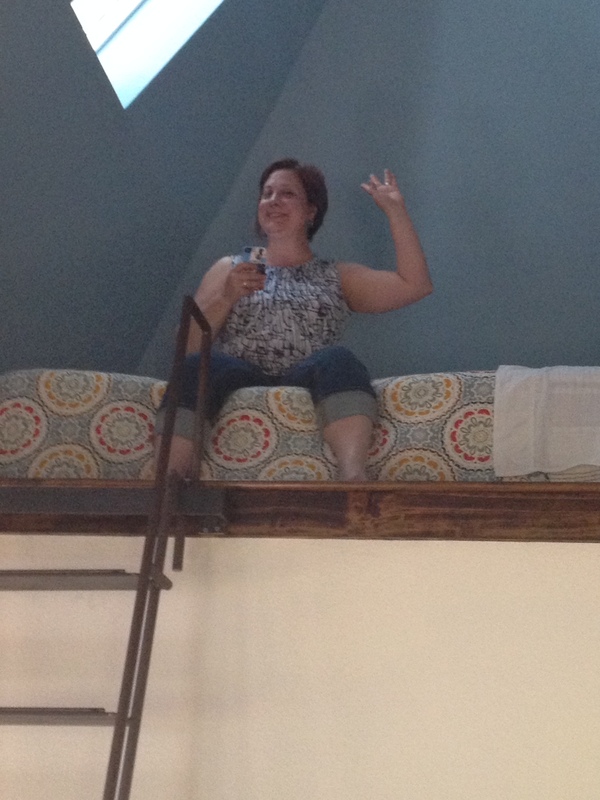 It’s super cute with a nice little porch and has a great loft (that’s where I slept). Check out the website when you get a chance and you can see a bunch more photos and get all the details about the amenities. 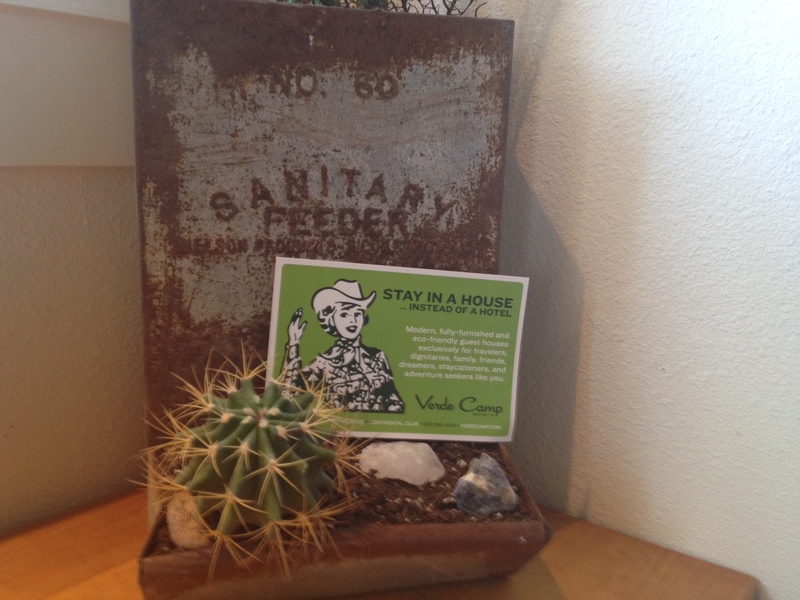 And if you’re ever planning a trip to Austin, definitely consider staying there. And tell ’em who sent you! This entry was posted in So and tagged austin, bruce, Cicada House, dogs, Godiva, Guinness, Julie Petroski, Texas, travel, Verde Camp. Bookmark the permalink. Love your cottage. Really sweet. And what a great ‘portrait’ of the 2 Gs. Your babies sure do know how to pose for the camera :). Safe travels. Have a great trip. Thank you! Bruce has all the Gs well trained for photos. Godiva was almost a year old in that photo. I’m headed to San Francisco so I bet I’ll post a photo or two. One of my favourite cities. Enjoy. Mine too! I’ve spent a lot of time there.